Choiroke is an annual choral festival run by the BRAVO Trust Fund, a charity to provide valuable funds to help support and develop performers in our area. Alternating between being staged in Sussex and Surrey, this year it was held at Dorking Halls on 11th February. What is special about Choiroke is that it embraces all styles of choirs and has the added twist that each choir is asked to perform one song where the audience and other choirs join in – the ‘oke’ part. SHYV were delighted to be the first young people’s choir to perform at the event and they gave a superb performance of their three songs. Kaytie Harding (Musical Director) and Louise Camby (Producer) were a superb team with endless energy, enthusiasm and military organisation. We had a fabulous time and so did our supporters. Two of SHYV have written their own accounts of the festival. I arrived at 4:30 pm at Dorking Halls and gathered in the foyer with the rest of the Surrey Hills Young Voice Choir. We all seemed really nervous and tense. We had to sign in just in case there was a fire alarm and then we sat in the front row waiting for our turn on the stage, but immediately we were taken on a tour of the theatre. We saw our dressing room for the first time which was really cool as it had a star on the door and inside it was one room divided into two for two dressing rooms. We then had a rehearsal on the stage with a small audience who clapped a lot!!! We were all starving for our tea and eventually we had our sandwiches in our dressing room all huddled together. The audience then started to arrive because we could see lots of bodies and heard lots of talking outside. Meridian 107 radio appeared and sat down and then we went on stage with all the other choirs; we were in the front as we aren’t very tall. The curtains then opened and our hearts were racing and we felt so nervous. We sang Adiemus which sounded amazing. We then went off stage and back to our dressing room where we had about 15 minutes until we were on stage again. This was our moment to relax before going back on stage to sing our hearts out. To sing in front of all those people made me feel so important and proud as I have never done that sort of thing before. On stage the lights were hot and our faces felt as though they would melt. We sung three songs which included Mamma Mia, Don’t Stop Believin’ and 42nd Street with choreography!!! It was so exciting when everyone clapped so hard after we had sung. 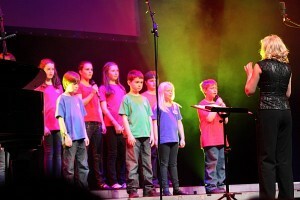 I had the honour of being chosen to tell the audience all about our choir, which was probably the best part for me!!! During the interval we were interviewed by Meridian 107 with a large microphone and we all had plenty to say!!! After that we then sat down in the audience to watch Part 2 and I had a chocolate ice cream, yum yum!!!! When the last choir was performing we walked up the stage steps and sang three songs with all the choirs and audience – a choiroke!!! The audience wanted more and so we gave an encore!!!! After it had all finished at 11:00 pm we were all tired and when I got home I flopped onto my bed . . .
Amazing! The word that just about sums the whole experience of Choiroke up and I am sure I am speaking for the whole choir. The event was exhilarating and the day had a concoction of emotions from the thrill and the buzz of performing in front of a large audience to the nerves of singing solo. I know we captured the audience with our enthusiasm for singing as we put our heart and soul into the songs that we have certainly grown to love. We performed with gusto to the songs: Mamma Mia – that appears in the hit west end musical; 42nd street and my favourite, don’t stop believing! (That was made popular from the hit TV series Glee). The afternoon started off by the whole choir turning up in our eye-catching t-shirts that sport the motto ‘we go together’. I think this really shows how we couldn’t sing without the input of the whole choir and our choral director Debbie who is equally as bigger part of Surrey Hills young voices as the rest of us. After turning up we walked through the building to see the stage we would be performing on. It was defiantly the biggest yet and maybe this is why the experience was so enjoyable. Next came the tour and the run through of how things would happen. We saw our changing room and it made us all feel utterly professional and privileged to be part of the event. After this a few of the younger ones were complaining about their stomachs and were saying ‘When’s dinner!’ this certainly made me chuckle. Later that evening it came to performance time and my heart was racing. We entered the stage and the audience clapped, even the sound of the hands been put together was loud and we hadn’t even sung yet. Once we had performed our songs we had a slight weight off our backs and the adrenaline made me happy that we had performed so well. Then there were the whole events songs and that is when the real sound and Choiroke came into play. It was incredible! The whole event couldn’t have worked without the organisation skills of everyone involved, the audience participation, the dedication of the choral directors (especially Debbie who somehow manages to put up with us every week) and the singers themselves. I certainly enjoyed the experience and I am sure everyone else did as well.